Volkswagens new 110,000-capacity assembly factory in India will be the first to feature a standard layout that will be used in other VW group plants. BERLIN -- Future Volkswagen factories, including the automakers new plants in India and the US, will have the flexibility to produce nearly every model of the VW group. VW hopes a standard layout for new factories will cut production costs and help the company to reach its target to overtake Toyota, the worlds largest carmaker, by 2018. Flexibility is key for our plan to catch Toyota, said VW group production head Jochem Heizmann at a recent press event here late last year. To increase its group global sales to 11.2 million units by 2018 from 6.2 million in 2007, VW is building factories in regions where it has no local production or currently only builds cars on a small scale. VW is the least efficient manufacturer among European volume auto-makers, according to a confidential Harbour Report quoted in the German business magazine Capital. The report, which analyzes automotive factory efficiency, said VW takes an average of 35 hours to assemble a car. Top of the list is Nissan, which at its two European plants averages 14 hours. "Flexibility is key for our plan to catch Toyota," said Jochem Heizmann, VW group production head. Besides opening flexible factories, VW also is using more standardized components in its cars and is developing modular architectures, which will make it easier to build a wider variety of cars in future factories. 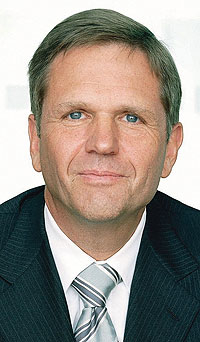 Heizmann aims to increase VWs productivity by 10 percent annually until 2018. He said developing modular components, architectures and production site layouts will create huge cost savings in factory investment, product development and procurement. Standardization is essential if VW is to reach its 2018 target, Heizman said. As an example, he said VW currently has different ways to fit an instrument panel into the car and different ways to join materials on the assembly line. We want to standardize those ways, he said. The modular approach will help VW develop niche cars and bring them into production quickly. VWs new plant in Pune, India, will be the carmakers first factory built to a new standard layout. Other new VW factories will have floor plans, assembly lines and production cycles which are similar to the Pune plant, which will open March 31. The factory is scheduled to produce up to 110,000 VW Polo and Skoda Fabia hatchbacks annually. VWs next flexible factory will be in Chattanooga in the US state of Tennessee. It is due to begin production of an upper-medium sedan in early 2011 with an initial capacity of 150,000 vehicles a year.